Avoid line ups and make your Drop In experience easy by registering online! The best parts: You can electronically accept your waiver forms and pre-pay by credit card (Visa and Mastercard acccepted). *NEW* REGISTER FOR DROP IN ONLINE! PLEASE NOTE: For safety reasons, we are only able to accommodate the first 60 Drop In guests. Please sign up online or arrive early to secure your spot and avoid disappointment. Also note that we strictly enforce a Maximum of 3 children per supervising adult. Read our Adult Drop In Rules here. When registering online, you will be prompted to read and electronically accept our waiver terms and conditions for each participant once per July 1 – June 30 calendar year. Acceptance of these terms is required to be permitted entry into the gym. If registering in person, a fully executed (and witnessed) waiver is required to be permitted entry into the gym and must be completed once per participant per July 1 – June 30 calendar year. To make your sign-in as smooth as possible on the day of, we highly recommend registering online. If you do prefer registering in person, please come to your first Drop In with Waivers pre-signed. If you do not have access to a printer, please arrive 15 minutes early on your first visit to complete the mandatory waivers. Please read our TRAMPOLINE RULES HERE! **Parent must be in the gym to provide direct supervision and remain responsible for their children at all times. **Maximum of 3 children per supervising adult. REGISTER FOR PRE-SCHOOL DROP IN ONLINE! 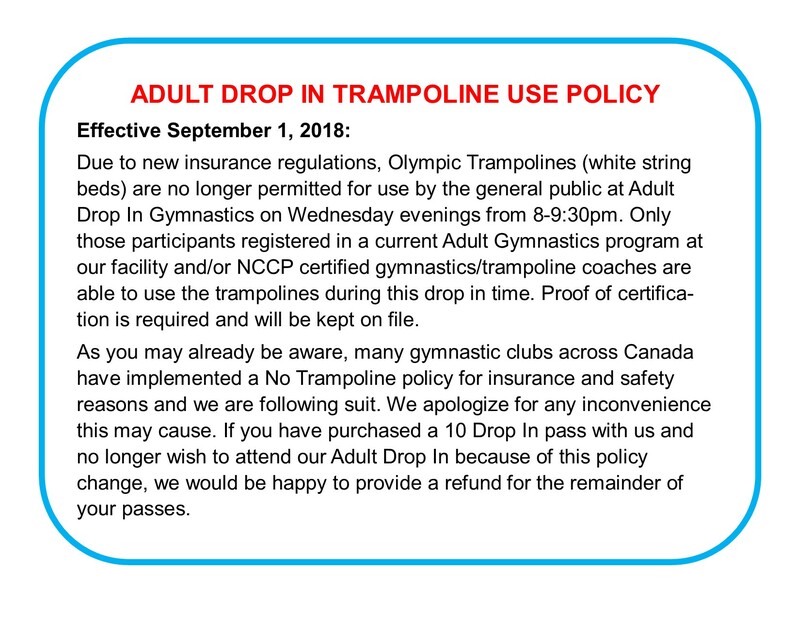 EFFECTIVE SEPTEMBER 1, 2018: PLEASE NOTE THAT THE USE OF OLYMPIC TRAMPOLINES (white string beds) IS NO LONGER PERMITTED FOR ADULT DROP IN EXCEPT FOR NCCP LEVEL 1 CERTIFIED GYMNASTICS/TRAMPOLINE COACHES AND THOSE WHO ARE REGISTERED IN OUR ADULT GYMNASTICS PROGRAMS. PLEASE READ OUR NEW TRAMPOLINE USE POLICY FOR ADULT DROP IN GYMNASTICS. Relive the glory days or finally embark on your long desired gymnastic journey. You are never too old to start gymnastics and being a ‘former’ gymnast is a thing of the past. All mature and responsible adults are welcome to come and play in our soft and safe facility under the supervision of a highly qualified coach. Come by yourself or bring a few friends – the more the merrier! Whether you aim to get fit or improve on a skill, this night is dedicated to you. Our Adult Drop In culture is one where participants respect themselves, our space and each other. Although unstructured, the energy and vibe of this evening is not a free for all. Our environment is open to mature and responsible adults who do not put themselves or others in danger. We have a zero tolerance policy for taking unnecessary risk. Those “chucking” skills without demonstrating the proper basics will be asked to leave. Those not sharing equipment will be asked to leave. Those appearing to be under the influence of alcohol or drugs, including marijuana, will be asked to leave. Anyone who puts our supervisor on high alert will be asked to leave. These rules are strictly enforced and we ask that all participants play a role in helping to keep our space safe and welcoming. REGISTER FOR ADULT DROP IN ONLINE!